"Aimi Rainbow Loves The Flowers"
The cherry trees in the park are heart achingly and beautifully laden with their luscious blossoms. Soft gentle light with golden tones kisses London tonight and purple lanterns of Wisteria hang from once dingy walls and gladden the heart. I’ve got a feeling that this burst of colour is meant to be here in May (my favourite month) and may be a month early but anyway I’m not complaining. 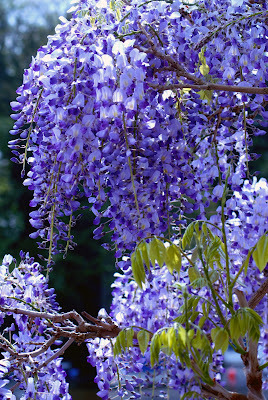 Went for lunch with Bernice in Twickenham where I took the pics of the Wisteria that covers her house and we all enjoyed watching a family of Ducks on the river across the road from Ferry House. We are having an early heat wave. It is not expected to last past the weekend but it is blissful to feel the sun on ones shoulders and head after such a long gloomy winter. My heart is very ‘gladdened’ today because Naughtiness is much better and we had such a nice chat courtesy of Alexander Bell after his last shift in Scotland. I really think he is on the mend again. He was very complimentary about the blog and the little film I created last week and it made me feel good because I really respect his judgement. 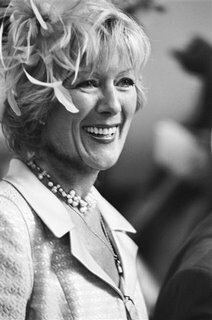 Took Pam to the A & E dept Charing Cross Hospital with a broken leg and was told off for parking at the door whilst I helped her in! . I am gearing up steam to write to the Parking authorities. I do try not to moan but the latest ticket courtesy of Westminster Council has really got my goat. It was given at 10.55 at night whilst I was doubled parked as close as I could get to Sue’s 60th birthday bash so that I could drive Jane Russell home who is 82 and very lame. I was helping her up the basement stairs to the car when someone placed it on my windscreen. What is it coming to when you can’t help an elderly lady to a ride home without a £50 penalty. Where will it end? Had a wonderful chat to Amir of Evermedia this morning. We have never met but after 20 minutes chat, are now bonded through our spiritual beliefs. He is into psychology and spiritual matters in a big way and we had a wonderful conversation comparing notes on how we have come to the same conclusions about these matters. A new friend! I know nothing about him – what he looks like – how old he is – what his circumstances are, but I know from our conversations we are on the same path and that I can communicate with him. I only phoned up to say there was no hurry on the latest films which his company is converting from my old super 8 cine reels to Camcorder tape so that I can edit them, add music and sound effects and make some happy memories on CD for friends and family. And he made the fatal error of asking me how I was, and, as usual, even with complete strangers I told him, warts and all! 20 minutes later (!) we discussed the DVD ’The Secret’ and he is going to send another recommended one about Quantum Science called “What The Bleep Do I Know’ and a relaxation tape he has made himself as a present. If you need anything at all, tapes, films, sound tracks, vinyl records copied to digital or other formats, I can’t recommend his company EVERMEDIA mail@evermedia.co.uk more highly having compared results which cost twice as much in London. I have counted 568 blooms which have have fallen off the Christmas Cacti this year, now bare again having supported me cheerfully all through the winter of chemotherapy, icy snaps and all. Naughtiness phone to say he had arrived in Kentucky safely. 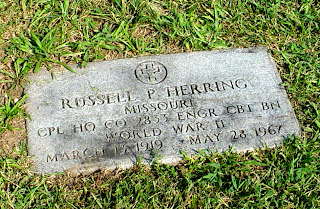 He is quite excited because he has managed to locate the tomb of his great-uncle, Russell Percival Herring and enclosed a photo and a loving card with a pressed flower plucked from the grave in it for me. I’m not quite sure what variety it is as its quite squashed but it was such a sweet thing to do, and I shall treasure it and have put it by my bedside to remind me of him while he is away. Flavien, my young tenant, came home in a state of excitement yesterday. Prince Harry had attended the Fulham Vue Cinema where he works with some friends to see 'Blades of Glory' and Harry and William had been there the previous week togethe r.
I don’t often have a bad day, as you know but I had a bad day today! I have had a row with my ex over the usual ‘Elephant in the Corner’ situation which has never been resolved and I fear never will be. It is such a shame because it could all be so simple. "My my my!!!" I guess l must be better as life is returning to normal and I no longer feel so protected from the slings and arrows. Talked to Caroline Upton about the Elephant in the corner situation that won’t go away from a Bhudist perspective and I have decided to ‘chant’ about it and perhaps if I can find a new view the situation may change or resolve or at least I can let go of the tapes in the head that cause such painful & toxic feelings. I have decided to hand it over to Good Orderly Direction and have put a sign on my bathroom mirror as suggested in a 12 step program many years ago. His Naughtiness phoned to say goodbye this morning. He is on his way back to Fort Knox and the Medical Unit at the U.S. Army School in Kentucky. He will try and keep in touch, but it will be difficult from there. 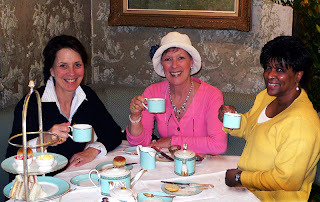 I felt a great wave of sadness and a feeling of loss today which only lifted slightly when I met my good friends Cynthia Rogers and Maxine Thomas for a wicked tea at Fortnum & Mason’s in Picadilly – (less than 24 hours since re-joining Weight Watchers!!) 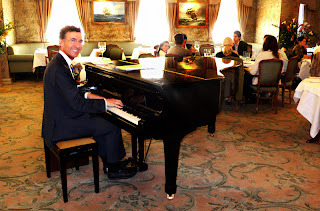 and I tucked in to smoked salmon finger sandwiches; two scones with clotted cream and raspberry jam and a small chocolate mousse, to drown my sorrows whilst the pianist with a beautiful smile played "Feelings" on a grand piano in the centre of the room. We had a most interesting discussion about the rise and fall of powerful men. - Cynthia's father, the distinguished writer Robert Coughlan having ghosted "Time to Remember" the Matriarchal Rose Kennedy's memoirs - and travel, Maxine being off to to various countries in the Southern Antipodes soon. Naughtiness has been such a source of delight and support over the past few weeks and I will miss my young admirer and his loving late night phone calls. Bon voyage Russell Herring – safe journey. Don’t forget me please. Tonight I had supper with darling Jane Russell, not the movie star, but nevertheless a very glamorous and exotic 82 year old who lives in Belgravia, and has had a most interesting life in her career with the Washington Post and a racy past! 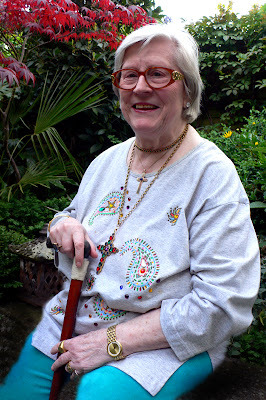 She claims over 100 male lovers - and one female - and has a wonderful sense of humour! We had Shepherds Pie and peas and mixed yoghurts to follow. 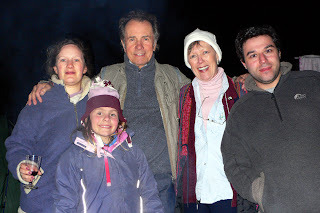 She has kindly suggested that this blog should be a book and that we should try and get it published and raise some money for one of the Cancer Charities, and I went to discuss how to accomplish this with her help whilst I treated her with Native American Indian Hopi candles to clear her ears. 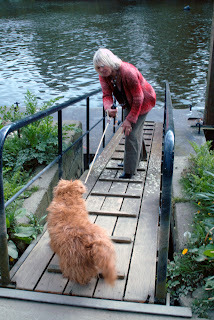 She has some great ideas on how to proceed, and when it is finished I shall have a go! brilliant, and if you had to write an essay about Rome in one sentence this shows a touch of genius and is amazingly and accurately succinct. 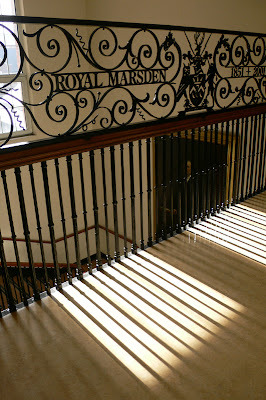 but while we`re here we should dance"
Well here I am – back at the Medical Day Unit at the Marsden after a four week break which, as said a couple of times already, followed the wonderful news that there is a good chance that I may still be here in 10 years time. A 94% chance, in fact, once treatment has been completed. Having completed the four month chemotherapy course, the worst is over, but I now have to start on a daily pill called Arimodex for 5 years. This may or may not produce hot flushes and other menopausal symptoms but if so, these will gradually ease off and acupuncture and medicinal herbs at the Haven can ease the symptoms. I am also starting a years course of Herceptin, the wonder drug which women went to the Law Courts to fight for, which is administered in a drip once every three weeks. In fact I have just had the first one. 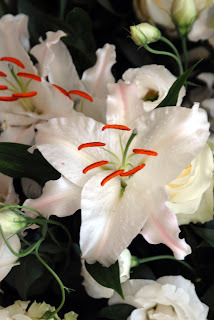 It was a doddle compared to chemo though I did get a reaction of flu’ like symptoms – feeling very cold and aching bones which are passing as I write. The first treatment they give you is a higher dose that the rest and I am not expected to react in future. The nurses are keeping me sitting here for an hour after the one and a half hours drip in case I have an allergic reaction and I have been chatting to some interesting people sitting next to me. The lady having treatment and one friend are from India and her other friend is from Zimbabwe. We have compared notes and all agree that this illness is spiritual in nature and will be beneficial ultimately. To have been presented with the death threat at the beginning and faced it means that I feel I can now face life better. Since I am not so afraid of the ultimate ‘bus terminal’, I am now not so afraid of life and its’ variety of vicissitudes. The ward is as cheerful as ever. There is a family group around a woman of about 40 who is having her first chemo across the way. They are all chatting and smiling and break into roars of (slightly over the top) laughter every so often. Everybody smiles when you catch their eye (it’s the “look” again!) and the nurses as per usual are angels of patience and good humour in human disguise. Cups of tea and fresh sandwiches have been provided over the lunch hour. I know a lot of people moan about the National Health Service, but every experience I have had with it has been great. When I had my first serious bout of clinical depression in 1989, my Holland Park NHS doctor popped in to see me every day with her little dog until I was better and gave me her home phone number to call in case I felt suicidal. My current practice in Fulham is also first class and will always fit you in if it’s urgent, but otherwise an appointment can be booked within a couple of days. My darling granddaughter Mia was put into my arms immediately after Aim had given birth to her at the Chelsea and Westminster by wonderful nurses in a clean atmosphere, and here at the Marsden I am receiving prompt and efficient treatment that I have yet to find anything to complain about. In addition this new wonder drug, Herceptin, is costing the NHS £25,000 to give it to me for a year – as a precaution and because it halves the risk of recurrence. Can’t complain much about that! Anyone from anywhere in the world will receive NHS emergency treatment in UK without question, which is more than you can say for the USA with all it’s wealth, and if you have cancer, heart problems or need knee surgery, then you are probably better off with the National Health than private as they have the most up to date equipment, don’t chuck you out as quick as the private clinics and provide follow up treatments for as long as necessary. When I slipped a disc in my neck in America which caused me agonising pain for about 3 years, the private surgeon wanted to operate on me but I didn’t agree. Now, years later my back is in excellent shape which might not have been the case if it had been cut about. 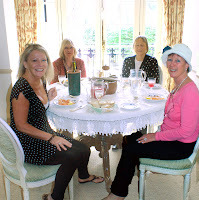 This weeks's highlight was a di nner party with a difference for 14 at Ruth and Allan's Coachhouse in Kew. 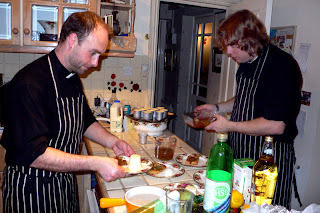 The 'Difference' being the two vicars, Fathers Stuart and Martin, who cooked a superb three course Cordon Blue meal for us! 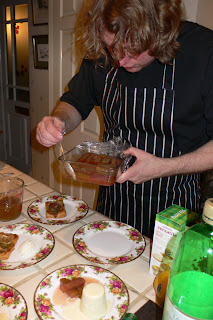 It was their way of raising money for charity and it was great fun to watch them preparing haute cuisine for us in Ruth's kitchen. Ruth Gledhill and Alan Franks both write for the Times. The party consisted of several highly intellectual friends. Writers and poets who were far more educated than I, an d I felt fairly out of my depth conversation- wise. I decided that it was a good opportunity to learn something I didn't know and listened and learned (a bit! A lot of it went over my non-university bred head). To keep my self-esteen afloat I reminded myself that they most probably didn't know how to edit a movie in iDVD or create a new music album complete with original cover, or s wap heads on photos in Photoshop! I also contributed the theory that a potential new TV show was presenting itself. 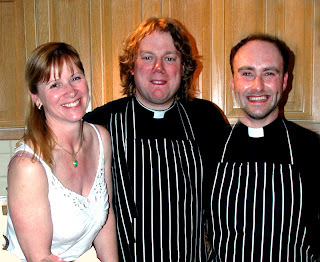 "Two Clerical Cooks"; "Priests for Feasts" "Culinery Clergy"; "Ministry Meals" were suggested, and my favourite "Dog Collar Dinners" and we all had great fun exploring the potential of this notion. 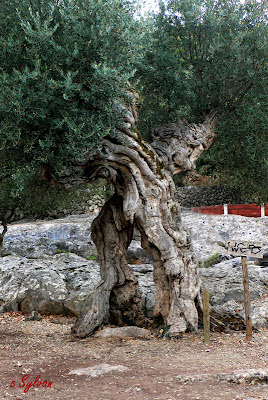 My strength is gradually returning, as is the good weather, and I am looking forward to more hair and my upcoming holiday in Majorca at Chris’s villa where I intend to laze about, soak up the sun and hopefully be restored to my former vitality very soon. The clocks went forward (Spring forward – Fall back!) a week or so ago and suddenly Spring is here. It is Easter Sunday. A sunny crisp weekend with blossom and leaf sprouting as I write. I have chosen to stay in London as I just love London on a Bank Holiday weekend. The streets deserted and the pace slow and easy like it used to be before we all started spinning plates 24/7. I did absolutely nothing on Good Friday except ‘potter’ – one of my favourite occupations! I finished off the film I have been editing for Naughtiness and felt really pleased with it; tidied bits of the house and my papers and put the washing on in a very leisurely way. Yesterday I worked for Jazz Flower Company of Wandsworth and took photographs of their beautiful flower arrangements at the Lanesborough Hotel - scene of such joy and the perfect day some 10 months ago when Aimi & Massimo got married there. laid up elegantly for someone else’s wedding. What a kaleidoscope of happy memories that room held! A five o’clock Barry, my ex collected me and we drove down to Holland Wood Camp site in Brockenhurst in the New Forest to have a barbeque supper with Aimi and co and friends, Nick, Caroline and Mia’s friend Nicole, who have been camping there since Thursday. I managed to get Barry’s satellite navigation going on screen but couldn’t bring up the voice. We got there in good time and only went wrong a couple of times when we were singing harmonies and I forgot to look at the thing, and, of course, no voice alerted us to a turning ahead. Sitting round the barbeque and guzzling chops, steak, large mushrooms and toasting marshmallows was great fun though quite chilly. It is not my idea of heaven having no mod cons in very cold weather, but they all seemed to be enjoying the experience. It certainly is a beautiful part of the world. England as it was, and quite a surprise to see beautiful ponies and some cows roaming free in the streets and villages as well as in the forest. I took Mia a nd Nicole a Toblerone Easter Egg, the remains of which had to be put away carefully when they went off to bed ( in what looked like three layers of pyjamas and woolly hats) as any food left out at night gets eaten by the fauna! It’s the very first time that there has not been even a tiny plea to stay up a bit longer, generally followed by a few sharp words from Aimi, as the lack of TV and the cold night air made bed in a warm sleeping bag the better alternative. Tomorrow I will drive to Oxford to see my dearest Auntie Amy who is swiftly approaching the great age of 99 in June, and we will chat till we run out of news and then have a game of scrabble which she will probably beat me at. If it’s sunny and not too cold, I shall wheel her out into the garden and we will have a cup of tea and some cake there as well. Aimi and co arrived back early from their camping expedition! It seems that one of the air beds sprung a puncture and that they decided was that. Enough of nowhere to plug in your mobile phone and hairdryer, and back to the warmth of their cosy flat. The little man who has been sharing my bed for the weekend was packed up in his travel box at 10 am this morning and, after a cuppa with Aimi, I kissed him goodbye and he departed and I put back all the nick nacks that he had knocked over during the weekend. I had forgotten how active Burmese cats are.! Got up late and had a long lazy bath with Radox Solutions ‘sensual’ bath oil, then off to Holland Park where Spring is ‘busting out all over’, to photograph my young 22 year old French lodger, Flavien with Lucille his ‘amour’ who has come to stay for a few days over Easter. They are blissfully in love, and he had asked me very sweetly if I would take some photos of them both together an d I relented. I was glad I had done so because they are so charming, natural and sweet together that the session was very enjoyable and, in addition, Flavien’s aunt Christina invited me to lunch at the Belvedere Restaurant prior to the session and I was treated to a slap up meal! Back home at 5am for a nap on the sofa; a lovely long warm chat to Naughtiness on the phone from Scotland, and the arrival of my latest tenant, Tim from Bath - a qualified engineer who is changing direction and becoming a chef. 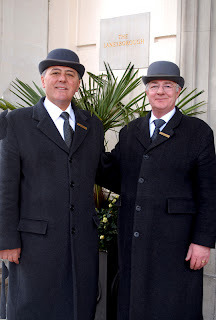 He is working at the Ritz hotel and learning his new trade. Gave him a cuppa tea, had supper, wrote this and now off to bed feeling happy and that all is well and good things ahead are to be expected!